Introduction: The epidermoid carcinoma of the upper aerodigestive tract is diagnosed in approximately 40% of the cases of advanced clinical stages. Objective: To evaluate the disease-free interval in patients with clinical stages I and II epidermoid carcinoma who were submitted to surgery or chemoradiation. Method: Retrospective study of the records of 139 patients treated for oropharyngeal epidermoid carcinoma submitted to treatment with curative intent. Among those patients, 38 were classified with early tumors clinical stages I and II. Twenty-seven (71.1%) underwent surgical treatment whereas eleven (28.9%) were treated with chemoradiation. The mean age was 56.4 years; 31 cases (81.6%) were in men and seven (18.4%) were in women. Results: Among the eleven patients who were submitted to chemoradiation, 72.7% obtained locoregional control of the disease and their disease-free survival was of 42%. 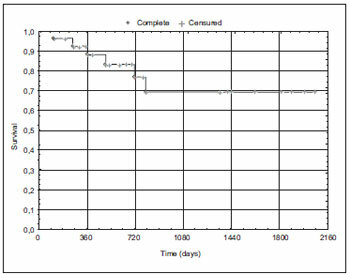 Among the 27 patients operated, 19 remained in Clinical Stages I and II in the histological report and six underwent postoperative radiation therapy. The disease-free interval for two years was of 70%. Conclusion: The patients submitted to the surgery had a better disease-free interval as compared to those submitted to chemoradiation treatment. The upper aerodigestive ways epidermoid carcinoma has an incidence estimate in the United States, according to the American Cancer Society, of 40500 new cases in 2006, and the pharynx epidermoid carcinoma incidence is of 8950 new cases, with an estimate of 2110 deaths, and about 40% of the cases diagnosed in advanced clinical stages (1). In Brazil, the head and neck cancer estimates, according to INCA (National Institute of Cancer) mention mouth tumors, with indexes of 10300 new cases for 2008 (2). The oropharyngeal epidermoid carcinoma corresponds to approximately 25% of the head and neck malignant neoplasms, and the advanced phase tumors (III and IV) have multimodal treatment indication (surgery and chemoradiation therapy) (3). As for the non-surgical treatment prognosis of the oropharynx tumors, the association of chemotherapy to radiotherapy has led to better results, compared to the conventional radiotherapy (4.5). However, the locoregional control indexes with radiotherapy treatment were efficient, with five-year disease-free survival of 85% in clinical stage I tumors and 79% in CS II (6). Selek et al. (6), evaluating 175 patients with early clinical stages oropharynx tumors (I and II), treated with exclusive radiotherapy, showed five-year local control of 85%. As for the early surgical treatment, a study with 92 oropharynx tumors T1 and T2 and absence of cervical metastasis in 48 cases obtained five-year local control index of 87% (7). The therapy options offered to the patient must aim at the highest survival indexes and, taking into account their morbimortality, the functional and aesthetic after-effects, the day-by-day and professional consequences for the patent and his or her quality of life. Therefore, the matter of resectability (or not) of the lesion is only one of the basic factors in the head and neck surgeon's dilemma (7). The objective of this study is to evaluate the disease-free survival in patients with early clinical stage oropharynx epidermoid carcinoma, submitted to the initial surgical treatment or chemoradiation therapy. This study is based on the analysis of 139 consecutive records in patients with oropharynx epidermoid carcinoma submitted to initial curative treatment, in the period from January, 1999 through December, 2005. The approval of the Ethics Committee in Research of the institution was issued under the number 658. Out of 139 eligible patients, 78 patients were treated with surgery with or without complimentary postoperative radiotherapy and 61 were treated with exclusive radiotherapy or chemoradiation therapy. As for the anatomic sub-site, the tonsils region corresponded to 57% of the cases, basioglossus to 22%, soft palate to 14.5%, glossotonsilar sulcus to 3.6% and posterior wall to 2.9%. As for the clinical stage in the patients submitted to surgical treatment, we had CS I/II -27 (34.6%) and CS III/IV-51 (65.4%), and in the patients submitted to chemoradiation therapy, CS I/II- 11 (18%) and CS III/IV-50 (82%). Table 1 describes the clinical stage (CS) and the treatment modalities. Out of 139 patients, 38 were in the early clinical stages (I and II) and were submitted to surgery or chemoradiation therapy in the initial treatment, and the method was clinical of comparison between the cases submitted to surgery or chemoradiation therapy as initial treatment. In the inclusion criteria were the patients with early tumors (I and II) submitted to curative treatment, absence of prior oncologic treatment, Karnofsky higher than 70%. The exclusion criteria comprised the presence of simultaneous and synchronous tumors, patient's refusal to surgical treatment, presence of distant metastasis in the initial presentation and creatinine clearance lower than 30ml/min. The professed concomitant chemotherapy is carried out as from the tenth session of radiotherapy, with the use of cisplatine (CDDP, in the dosage of 30mg/m2, in six weekly cycles. The patients submitted were forwarded into radiotherapy and it was of the teletherapy type with linear accelerator device. The service follow-up approved is offered every 15 days and occurs until the end of the treatment, including the locoregional exam, deleterious effects management of the treatment and follow-up of the laboratorial parameters, such as creatinine, urea, electrolytes, leukogram and hemoglobin/hematocrit. Amongst the 38 patients with early epidermoid carcinoma (I and II), 31 (81.6%) were men and seven (18.4%) were women, with an average age of 56.4 years (ranging from 43 to 79 years). The absence of clinical evidence of the disease in the first 180 days was considered to be the full post-chemoradiation therapy locoregional control, as of the final date of the treatment. In the postoperative control, the same parameter was considered. In the statistical analysis, for evaluation of survival of the patients, the Kaplan Meier's actuarial method was used. In the global survival calculation, we used the date of admission of the patient. 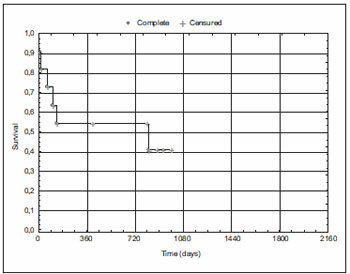 The median interval, as for the follow-up was of 25 months and there was no follow-up loss in this period. In the 27 patients of early clinical stage (I and II) submitted to surgery, all those in the clinical stage I remained in I with the histological exam and out of 18 patients of CS II, one of them became CS III and five became CS IV; these six patients were submitted to postoperative radiotherapy. Among these patients submitted to radiotherapy, the average dose was of 70 Gy and in five cases concomitant chemotherapy was carried out. As for the patients submitted to chemoradiation therapy, the radiotherapy average dose was of 70.4 Gy, and 72.7% of the patients presented locoregional control. At the end of the treatment of the patients submitted to chemoradiation therapy, the locoregional control was observed in 90.1% of the patients. As for the disease-free survival in the cases submitted to surgery and/or chemoradiation therapy, there was a statistically significant difference (p=0.000) - Graphics 1 and 2. Graphic 1. Distribution of the disease-free survival in patients submitted to surgery with or without postoperative radiotherapy (n=27 patients). Graphic 2. Distribution of the disease-free survival in patients submitted to chemoradiation therapy (n = 11 patients). The five-year global survival of the patients submitted to surgery was of 50% and to chemoradiation therapy, 22.5%. At the end of the treatment of the patients submitted to chemoradiation therapy, the locoregional control was observed in 90.1% of the patients with early stages tumors (I and II). The early CS operated patients and that remained, upon histological exam, as early pathological clinical stage, evolved with 11 locoregional recurrences with diagnosis on average of 210 days. The rescue index was of 72.3%. As for the radiotherapy treated patients, three cases evolved with locoregional recurrences, two cases had rescue surgery indication and the remaining case was not treated by clinical comorbidity (renal insufficiency). The oropharynx malignant neoplasms in early clinical stages (I and II) have treatment preferably radiotherapic, due to the difficulties for rebuilding and rehabilitation, resulting from this region muscular structure. In the other hand, the high incidence of cervical metastasis generally makes the radiotherapic treatment insufficient (9). Considering the local recurrences and the diseases persistence, the response at the end of the radiotherapy was of 81.8% in tumors T1 and T2, similar results are found in the literature, with 82.9% of local control (10). As for the locoregional control (absence of disease in the first six months of follow-up), we obtained higher indexes favoring the non-surgical treatment in the oropharynx early tumors. As for the early CS cervical metastasis, a patient developed regional recurrence, and the average period of follow-up was of 25 months (11, 12). In the literature, there are authors who emphasized the low incidence of regional recurrences in oropharynx tumors of CS I and II submitted initially to chemoradiation therapy or exclusive radiotherapy, which confirmed our results as well as the diagnosis of recurrence in the first 14 months of follow-up. The main factor of a worse prognosis in these patients is the occurrence of a second primary tumor in the upper aerodigestive ways (EVADS) (6). The surgical treatment in the oropharynx early tumors (I and II) may result in a lower morbidity than the irradiation of the pharynx in high doses, since radiotherapy, along with the primary tumor destruction, provokes functional deficits in the organ to be preserved. However, the radiotherapy may also cause the organ or structure function loss, such as soft palate, due to the post-radiotherapy fibrosis associated to the tumor cicatricial after-effect. The most recent publications that approves the surgical treatment in primary oropharynx tumors are not frequent; however, the University of Pittsburg recommends surgical resection of all early tumors of the tonsils region and, in another series of 168 oropharynx tumors, at the University of Helsinki, where tumors T1 and T2 comprised 53% of the cases, the five-year disease-free survival was higher than 70%, with surgery for all primary tumors (13). Moncrieff et al. (13) in a study of 92 patients with oropharynx tumors T1 and T2, 44 of which with clinically palpable lymph nodes and 57 cases submitted to postoperative radiotherapy, demonstrated a local control of 87% and without statistically significant difference between tumors T1 and T2. However, the five-year disease-free survival of 83% was ascribed to the presence of cervical metastasis, a prognostic factor independent on the size of the primary tumor. In this study, the five-year disease free survival index in the early clinical stages tumors submitted to initial surgical treatment may be ascribed to the presence of advanced primary tumors and of lymph nodes committed by the neoplasm upon the histological report. In the presence of locoregional recurrence, the control after rescue surgery was of 87.5% of the cases, in the period comprised in the study. In turn, the recurrences in patients submitted initially to radiotherapic treatment were not susceptible of rescue in 66.7% for irresectability lesion or clinical comorbidities of the patient. 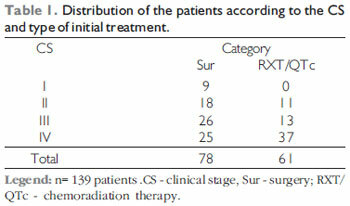 Such factors may be ascribed to the chemoradiation therapy indication in patients with worse clinical state, compared to the patients operated, failure in the locoregional exam and/or difficulties of diagnosis of the locoregional recurrence, as a result of the tissue effects of the radiotherapy. The five-year global disease-free survival of the cases submitted to surgery was higher to irradiated cases, a factor that may be ascribed to the radiotherapy indication in the initial treatment in patients with more incidence of clinical comorbidities, or rather, poor clinical conditions at admission, such as active etilism and alcoholic abstinence. The Hospital Erasto Gaertner, in Curitiba, Brazil, evaluating 361 patients with oropharyngeal epidermoid carcinoma submitted to chemoradiation therapy. Although 92% of the cases were advanced CS (III and IV), The presence of comorbidities was a predictive factor of a worse prognosis in the univaried and multivaried analysis (14). Before the results found in this study, we may presume that radiotherapy is a better option for treatment in patients with early oropharyngeal tumors of CS (I and II). However, it's necessary a higher number of cases of irradiated patients for evaluation of the results found and definitive conclusions. Another factor is the absence of a radiotherapy service working in the same place as the multidisciplinary team with surgeons and oncologists of the Head and Neck Surgery and Otorhinolaryngology Department of Hospital Heliópolis, a matter that brings a higher number of surgical indications in patients with head and neck epidermoid carcinoma. The surgical treatment showed a better index of disease-free survival, due to the lower number of deaths for other causes, as compared to the patients submitted to chemoradiation therapy. 2. Doctor's Degree in Medicine at the Post-Graduation Course in Otorhinolaryngology and Head and Neck Surgery of the Federal University of São Paulo - Escola Paulista de Medicina. Chief of the Head and Neck Surgery Service of Hospital Heliópolis - Hosphel, São Paulo. 3. Free Professor at Fundação Lusíada UNILUS, Santos. Head Professor of Otorhinolaryngology and Head and Neck Surgery of the Metropolitan University of Santos.